Ranger Bob sure gets around -- not only does he spread the wildlife message at schools, you’ll also see him out at events! 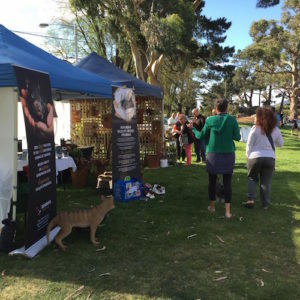 As the summer market season came to an end, we were happy to attend the Hobart Twilight Markets, the Ellendale Markets and the 100 Years of Parks Parliament Lawns event. Winter doesn’t mean torpor for Ranger Bob, so keep an eye out for his friendly face at events near you!